For the "giant marabou stork" of Flores, see Leptoptilos robustus. The name marabou is thought to be derived from the Arabic word murābit meaning quiet or hermit-like. The species was originally described in the stork genus Ciconia as Ciconia crumenifera by Lesson. The species was moved into the genus Leptoptilos and the ending was modified to crumeniferus and used by many authors until it was noted that the correct masculine ending to match the genus is crumenifer. The marabou stork is a massive bird: large specimens are thought to reach a height of 152 cm (60 in) and a weight of 9 kg (20 lb). A wingspan of 3.7 m (12 ft) was accepted by Fisher and Peterson, who ranked the species as having the largest wing-spread of any living bird. Even higher measurements of up to 4.06 m (13.3 ft) have been reported, although no measurement over 3.20 m (10.5 ft) has been verified. It is often credited with the largest spread of any landbird, to rival the Andean condor; more typically, however, these storks measure 225–287 cm (7–9 ft) across the wings, which is about a foot less than the average Andean condor wingspan and nearly two feet less than the average of the largest albatrosses and pelicans. Typical weight is 4.5–8 kg (9.9–17.6 lb), unusually as low as 4 kg (8.8 lb), and length (from bill to tail) is 120 to 130 cm (47 to 51 in). Females are smaller than males. Bill length can range from 26.4 to 35 cm (10.4 to 13.8 in). Unlike most storks, the three Leptoptilos species fly with the neck retracted like a heron. The marabou is unmistakable due to its size, bare head and neck, black back, and white underparts. It has a huge bill, a pink gular sac at its throat (crumenifer(us) means "carrier of a pouch for money"), a neck ruff, and black legs and wings. The sexes are alike, but the young bird is browner and has a smaller bill. Full maturity is not reached for up to four years. Like most storks, the marabou is gregarious and a colonial breeder. In the African dry season (when food is more readily available as the pools shrink), it builds a tree nest in which two or three eggs are laid. It is known to be quite ill-tempered. The marabou stork breeds in colonies, starting during the dry season. The female lays two to three of eggs in a small nest made of sticks; eggs hatch after an incubation period of 30 days. Their young reach sexual maturity at 4 years of age. Lifespan is 41 years in captivity and 25 years in wild. 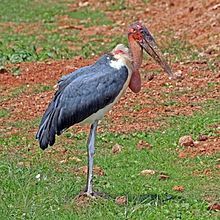 The marabou stork is a frequent scavenger, and the naked head and neck are adaptations to this livelihood, as it is with the vultures with which the stork often feeds. In both cases, a feathered head would become rapidly clotted with blood and other substances when the bird's head was inside a large corpse, and the bare head is easier to keep clean. This large and powerful bird eats mainly carrion, scraps, and faeces but will opportunistically eat almost any animal matter it can swallow. It occasionally eats other birds including quelea nestlings, pigeons, doves, pelican and cormorant chicks, and even flamingos. During the breeding season, adults scale back on carrion and take mostly small, live prey since nestlings need this kind of food to survive. Common prey at this time may consist of fish, frogs, insects, eggs, small mammals and reptiles such as crocodile hatchlings and eggs, and lizards and snakes. Though known to eat putrid and seemingly inedible foods, these storks may sometimes wash food in water to remove soil. When feeding on carrion, marabou frequently follow vultures, which are better equipped with hooked bills for tearing through carrion meat and may wait for the vultures to cast aside a piece, steal a piece of meat directly from the vulture or wait until the vultures are done. As with vultures, marabou storks perform an important natural function by cleaning areas via their ingestion of carrion and waste. Increasingly, marabous have become dependent on human garbage and hundreds of the huge birds can be found around African dumps or waiting for a hand out in urban areas. Marabous eating human garbage have been seen to devour virtually anything that they can swallow, including shoes and pieces of metal. Marabous conditioned to eating from human sources have been known to lash out when refused food. Marabou down is frequently used in the trimming of various items of clothing and hats, as well as fishing lures. Turkey down and similar feathers have been used as a substitute for making 'marabou' trimming. ^ BirdLife International (2012). "Leptoptilos crumenifer". IUCN Red List of Threatened Species. Version 2014.3. International Union for Conservation of Nature. Retrieved 5 August 2011. ^ Yule, Henry (1903). Hobson-Jobson. A glossary of colloquial Anglo-Indian words and phrases, and of kindred terms, etymological, historical, geographical and discursive (2nd ed.). London: John Murray. p. 7. ^ David, N.; Gosselin, M. (2011). "Gender agreement of avian species-group names under Article 31.2.2 of the ICZN Code". Bull. Brit. Orn. Club. 131 (2): 103–115. ^ Likoff, Laurie E. (1986). The Encyclopedia of Birds. Infobase Publishing. pp. 616–. ISBN 978-0-8160-5904-1. Retrieved 21 August 2012. ^ Muckley, A. "Leptoptilos crumeniferus". University of Michigan Museum of Zoology. 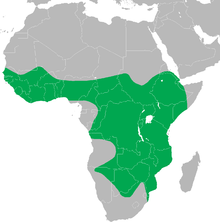 Animal Diversity Web. ^ Seibt, U. & Wickler, W. (1978). "Marabou Storks Wash Dung Beetles". Zeitschrift für Tierpsychologie. 46 (3): 324–327. doi:10.1111/j.1439-0310.1978.tb01453.x. ^ Bwangamoi, O.; Dranzoa, C.; Ocaido, M.; Kamatei, G. S (2003). "Gastro-intestinal helminths of marabou stork (Leptoptilos crumeniferus)". African Journal of Ecology. 41 (1): 111–113. doi:10.1046/j.1365-2028.2003.00418.x. Wikimedia Commons has media related to Leptoptilos crumenifer.